Walter Ramsey (center, tuba) in 2010 at the Prince of Wales parade. Photo © Matt Sakakeeny. Walter Ramsey is the bandleader and tuba player with the Stooges Brass Band. He attended John F. Kennedy High School as well as the New Orleans Center for Creative Arts (NOCCA). Walter was heavily influenced by Rebirth Brass Band when the group played at his elementary school, citing the experience as his primary motivation to become a band leader. He formed the Stooges in 1996, and the band quickly became prominent on the neighborhood second line circuit. 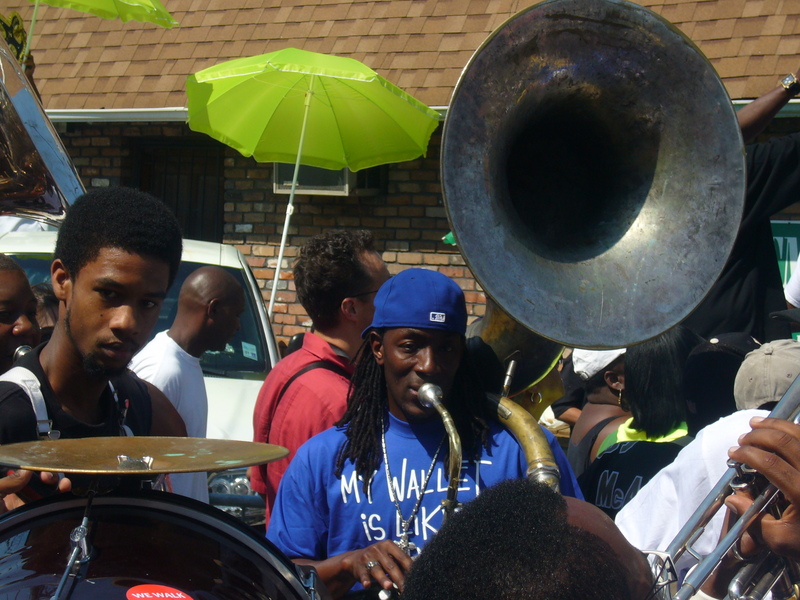 Walter oversaw the band’s rise within the New Orleans brass band scene, starting a legendary weekly gig at the Hi-Ho Lounge and winning several competitions, including the 2009 Red Bull Street Kings Brass Band Blowout. In 2004, Walter learned of the death of his friend and former band mate Joseph Williams who was killed by New Orleans police officers. The Stooges were due to travel to Japan the next day, and while on tour, Walter composed the tribute and protest song “Why Dey Had to Kill Him?” along with Garfield Bogan and Arian Macklin. The song was immensely popular and became cemented in brass band repertoire. With his business partner and Stooges founding member Andrew Baham, Walter composes music for ESPN and oversees all of the Stooges original music. Walter’s grandfather is the artist Ashton Ramsey and his younger cousin Thaddeus Ramsey plays bass drum with The Stooges.